As you know, we are all about power boards here at PBX, so today, I want to introduce you to a sport that is becoming very popular. Now this sport is not cheap, and is not something you do on your own, although you actually do. I will explain in a bit. I am talking about Flyboarding. Check out the video below and you’ll see what it is. Then check out the rest of this post because I am going to right in deep about this amazing sport / pastime. OK, now you’ve watched the video, you know right? But let me be a bit technical in explanation. A Flyboard is an item of water sport equipment that is used for hydroflighting or flying over a body of water. Invented in 2012 by Franky Zapata, a French watercraft enthusiast, the device has risen in popularity among those who love water sports. The Flyboard looks similar to a snowboard and resembles it in size as well. It has a pair of boots for the rider to put his feet on. Underneath the boots are jet nozzles which are attached to the end of a big hose. The pressure of the water from the jet nozzles provide the thrust and can enable the user to rise above the water to a height of 15 meters. The water that thrusts the rider above the water is pumped from a jet ski. As the rider hovers in the air, the jet ski follows his trail so that it can keep on pumping water into the hose attached to the device. Reducing the water pressure reduces the thrust. The result of which enables control and causes the board to lower towards the water. Stopping the water supply completely will stop the thrust and will cause the board and the rider to plunge into the water. The board is made of a buoyant material so that when the rider wants to take a rest, he or she can just float on the water. Well that will soon get boring, so to get back up in the air, the rider activates the thrusters, and the high-pressure water is pumped through the hose and amplified via the jet nozzles to provide a downward blast to provide the required thrust that gives lift. Simple physics, that’s all. For safety purposes, the rider is required to wear a flotation device and preferably a helmet during a flight. The flotation device will keep him safe from the impact when plunging into the water while the helmet will protect his head and ears from getting injured, especially if he falls on the watercraft or on other hard objects. 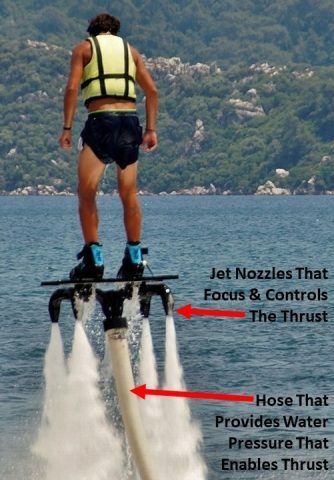 Unlike a hoverboard that relies on a battery to provide the power, a flyboard is powered by water pressure from jet nozzles under the boots that are attached to the end of a hose that is connected to the watercraft below, usually a jet ski. The person operating the Jet Ski controls the amount of water pumped into the hose. To prepare for the flight, the Jet Ski takes the device and the rider into the water. He or she must strap the boots firmly to the feet to avoid accidents such as falling down from the hydroflighting device. The rider then swims away from the jet ski, keeping the feet level and closing their legs. The rider then waits for the water to be pumped into the hose and the jet nozzles to thrust the device upward. The hydroflighting device then rises up to a maximum height of 15 meters. However, this will depend on the pressure on the jet nozzles. The more pressure there is, the higher the device can go. Reducing the pressure of the water will make it go lower. As the flyboard and rider elevates, it pulls the hose to whichever direction the rider wants to go. Since the power from the watercraft is used to pump water into the hose, it just trails behind the board. If you observe the flight closely, you will see how it follows the movement of the flyer. Once in the air with the jet nozzles giving it a thrust, the rider takes full control of the flying device using his body movements. If the rider wants to go down, all he or she has to do is to point theirs toes up and to go up, point the toes down. To move toward the left, the rider should lift the right knee and to move toward the right, lift the left knee. Using these movements will enable the board and the rider to travel in any direction at will. One thing the rider has no control over is the height that he can reach while flying on the board. Once in the air, the riders fate lies in the hands of the person in control of the jet ski below. This person is really the controller, and can make the rider soar or plunge by adjusting the amount of water being pumped through the hose. The more water being pumped through the hose, the more powerful the pressure and resulting thrust, so the higher the board and rider will rise. The smaller the amount of water flowing through the hose, the weaker is the pressure and the lower the board and the rider flies. The rider can land on the water by maintaining their toes pointing upwards. 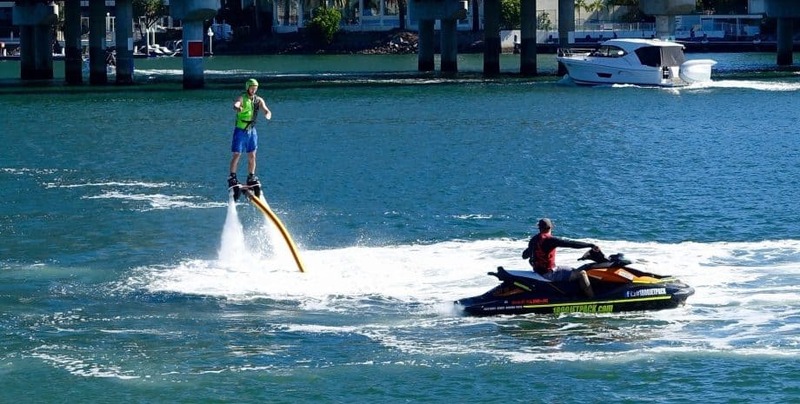 Once the flyboard touches the water, the rider will need to maintain their balance to be able to stand on the board as it floats on the water. Now that bit takes a bit of getting used to as well. This sport might look simple, but like most things, it might look simple, but there’s actually a lot more to it than you think. What Equipment Do You Need To Go Flyboarding? There are a few things that you will need before you can enjoy flying on your hydroflight device. These are a watercraft, watercraft pump, hose, and water jet nozzles. Usually, a jet ski is used. It must have a pump to feed water into the hose with water jet nozzles on its end. The nozzles are attached beneath the boots on the board. The pressurized water from the nozzles provides the thrust that the device needs to rise and move in the air. Where Can You Purchase a Flyboard? If you already have a jet ski that you can use for your Flyboard, you can purchase just this device in any stores that specialize in selling water sports equipment. However, you need a kit that contains everything you need to fly. This contains the hose, the jet nozzles, and a pump for the hose. One company that has become prominent in manufacturing and distributing Flyboards in the US is Powerfly Products. For your convenience, you can place your order online. Jetpack America is another store that sells this device on its outlets or online. Jetpack America is recognized as a trusted seller of the best hydroflight gears worldwide. 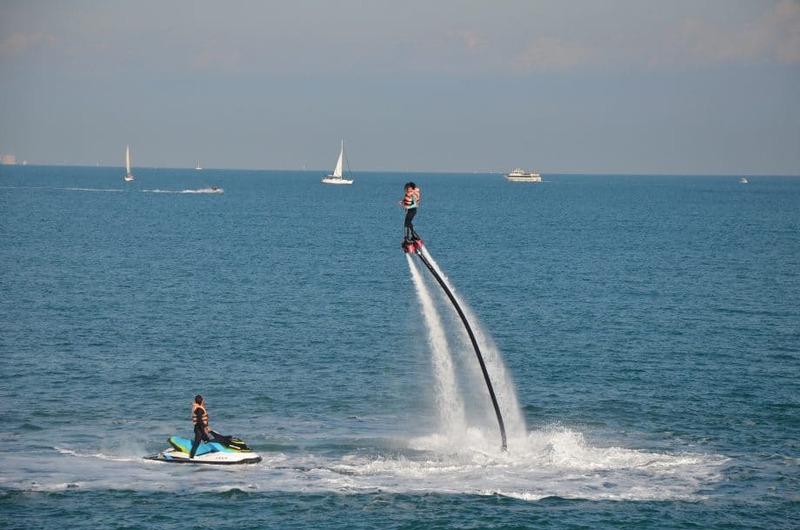 They sell popular brands such as Flyboard, Flydive, and Jetovator. There are also popular suppliers of this water sports equipment in Australia, Canada, and Singapore and if you live in these countries, you can easily get everything you need for your hydroflight. 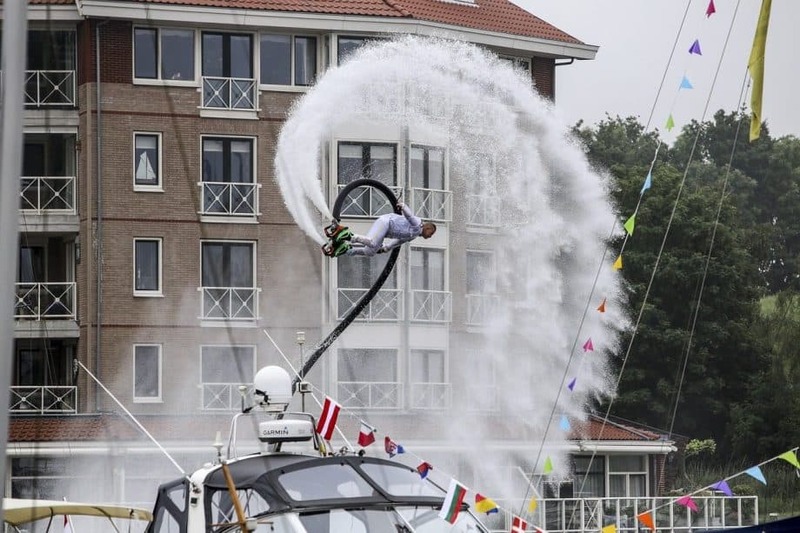 How Much Does A Flyboard Cost? Jet ski aside, you can get a Zapata Flyboard for example for $6,600 but if you want to look for great deals, you can check eBay and other online stores that offer ranges of discounts and other offers.